The Privett Park outfit know a win against Hambledon at Ridge Meadow on Saturday will guarantee their safety. 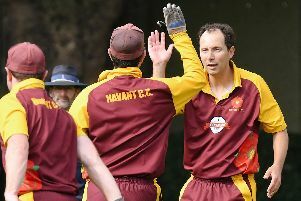 A thrilling one-wicket success against fellow strugglers Lymington II lifted them out of the relegation zone. But while they are in the driving seat – with rivals Lymington II and Havant II face difficult final games, Harrop insists his team cannot take anything for granted. The Borough vice-captain said: ‘We still have a big job to do. ‘Being the person I am, I produced a spreadsheet for all the players showing them how many points we need. ‘The long and theshort of it, though, is we have to win to guarantee safety. We must aim to go to Hambledon to win the game. ‘If we can do that then we make sure and it doesn’t matter what the other teams do. Borough will welcome back two of their exciting young talents – Jack Richards and Jacob Harris. The pair, who have proved match-winners with both bat and ball, were at the Reading Festival last weekend. They replace Craig Stares and last week’s match-winner Charlie Pennicott, who are unavailable. Harrop added: ‘I think they have both dried out now! ‘It is vital we stay in the Southern League. ‘We want to offer the highest level of cricket we can, particularly to the youngsters coming through. ‘There are some good youngsters at the club and we don’t want to lose them. ‘With so many clubs in the area we face stiff competition for players. Harrop believes if the club stay up they can use the lessons they have learnt this summer to progress. Creating greater stability and consistency are seen as the key to avoiding a repeat of this season’s struggles.